The Ducks are still dancing. A couple of hard fought games highlighted by Kenny Wooten‘s ability to block the sun if he so chose got the Ducks out of the first weekend of the NCAA Tournament. A date with the Virginia Cavaliers looms large, and the Ducks didn’t look perfect in either game. They did, however, go on late runs that their opponents simply could not match. The first weekend is over and the Ducks are alive. The fat has been trimmed from the tournament, and teams are not “just happy to be here” anymore. They have to want it. They have to go out and get it, because nothing will come easy. The Oregon Ducks all-time record against the Wisconsin Badgers prior to March 22nd 2019 was 2-5. The Badgers were a mixed bag of veteran producers and young talent that didn’t make a lot of mistakes. They had the exact makeup of a team capable of a deep tournament run. Early on in the game it was a heated battle. One team would make a run, and the other would follow it with a stretch of defense so suffocating that their opponent could barely move the ball inside the three point line. After a first half that resulted in only 25 points per team, both sides came out of the half more aggressive on offense, each team exploiting the other’s focus on paint protection to hit two straight threes. It was Wooten’s play on both ends of the floor that broke the game open for the Ducks. The Badgers could no longer get into the paint for fear of Wooten’s long arms smacking their shots out of the field of play. His dunks on the other end only made the Oregon lead grow. The Duck’s outscored the Badgers 47-29 in the second half to win 72-54. Watching the tape, the Duck’s did not look like an underdog at any point during the game. The Ducks came out HOT in the first half, with a 35-23 lead, looking like the clear favorite. The second half, however, was a different story, with the Anteaters scoring the first 14 points of the half and taking the lead. 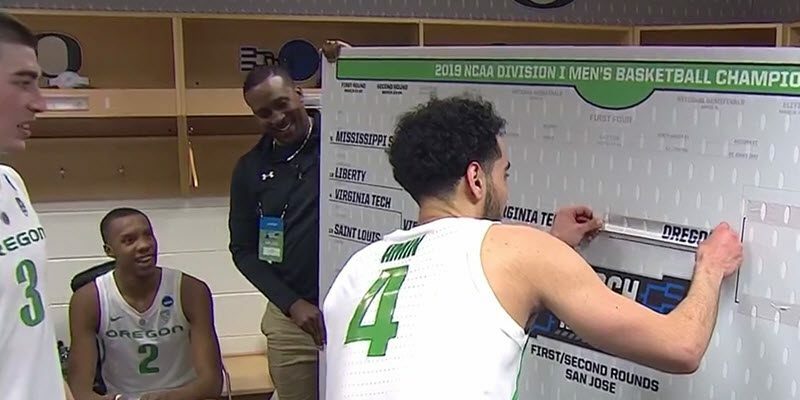 This looked like the Oregon team from mid-February that couldn’t buy a basket or stop anyone from scoring, not the team that was on a nine game winning streak and fighting for a spot in the Sweet Sixteen. That’s when Ehab Amin came in to the game with six minutes gone and got the Ducks going. UCI could not match his energy or stop him from hitting threes. Suddenly, a two point deficit turned into a big lead, and the Ducks ran away with the victory behind Amin. Not to be outdone as the energy guy, Wooten swatted away seven shots, bringing his tournament total to ELEVEN through only two games. The Ducks relied heavily on the three point shot (13 for 25 as a team) on offense with the Anteaters playing extremely tight defense, denying Oregon’s stars the ball for much of the second half. Oregon overcame their slow second half start to outscore UCI 38-31 in the second half, winning 73-54. The Ducks played the first two games like they belonged in the tournament, but now the time has come to prove that they are elite, and not just good. 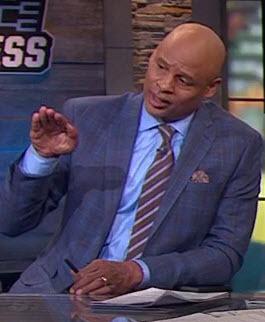 Clark Kellogg explaining Oregon’s trajectory. Virginia, a perennial powerhouse that routinely makes missteps in the opening weekend of the tournament, has made it out of the round of thirty two and on to the Sweet Sixteen for a date with the Ducks. The Cavaliers are a team dominated by guards that can score. Only 19 of their 63 points in the second round were scored by forwards, with zero points coming by centers. They do, however, get production from their three guards, all listed at 6’5″ or taller. This means that the Cavaliers will look similar to the Ducks on the floor. The Cavaliers are also just as hot of a team as UCI was coming in to this game, with their last loss coming on February 9th to Duke. Two of Virginia’s three losses occurred within the span of a week to Duke, in fact. Virginia also fields a stifling defense, only having surrendered 60 or more points on six occasions all season. The Cavaliers gave up 69 or more points only three times, and all three games were losses. That is going to be tough matchup for a Ducks offense that struggled at times to find their footing during the season. They’ll have to find it against a truly elite defense on a team expected to make a deep run into the tournament. Virginia is a Final Four worthy team, and if the Ducks hope to make it out of the second weekend, they’ll need to clean up several facets of their game. 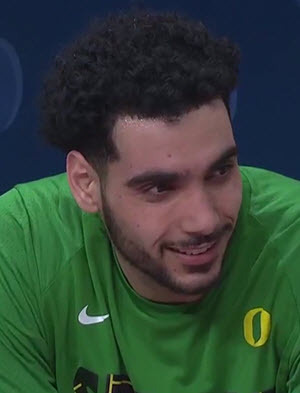 Ehab Amin was the fire for the Ducks. The Ducks have the type of roster that wins in March: Peyton Pritchard is the veteran leader and the best scorer on the team, Wooten is an athletic player who makes plays all over the court, Louis King is a surefire NBA player who can take his game to another level, and the entire roster plays hard defense. This team is an underdog from now on — until they lose a game or win the National Championship. Either way, welcome to the Sweet Sixteen.